THOS. RAPP AND PEARLS BEFORE SWINE-CITY OF GOLD AND …BEAUTIFUL LIES YOU COULD LIVE IN. Thos. Rapp and Pearls Before Swine- City Of Gold and…Beautiful Lies That You Could Live In. By April 1971, Pearls Before Swine were preparing to release their fifth album City Of Gold, which was BGO Records recently released alongside …Beautiful Lies That You Could Live In. City Of Gold would be Pearls Before Swine third release on Reprise Records, since signing to the label in 1969. 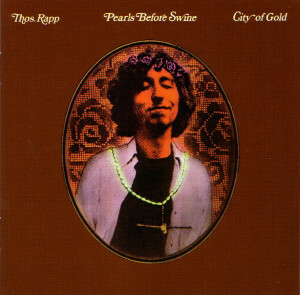 However, City Of Gold would be the first album to be credited to Tom Rapp and Pearls Before Swine. That seemed only fair, given that Tom Rapp was the only original member of Pearls Before Swine left. The rest of the band left en masse in 1969, before Pearls Before Swine signed to Reprise Records. Since then, Pearls Before Swine consisted of Tom Rapp, his wife Elisabeth and session musicians that were brought onboard for recording sessions and tours. It was no surprise that Tom Rapp wanted equal billing with Pearls Before Swine. However, that hadn’t always been the case. Pearls Before Swine was founded by Tom Rapp in Melbourne, Florida in 1965. The nascent band featured Tom Rapp and his high school friends Wayne Harley, Lane Lederer and Roger Crissinger. Tom Rapp quickly became the band’s songwriter-in-chief, and wrote the material that would feature on the demo that Pearls Before Swine sent to the avant-garde label ESP-Disk. By then, the band were sporting the name Pearls Before Swine, which they took from a quotation in The Bible (Matthew. 7:6). Not long after sending their demo to ESP-Disk, Pearls Before Swine were offered a recording contract by the label. This was what every new band dreamt of, and Pearls Before Swine signed on the dotted line. Soon, they began work recording their debut album, One Nation Underground with producer Richard L. Alderson. While Pearls Before Swine were a four piece band, they didn’t have a drummer. So session drummer and percussionist Warren Smith was drafted in before work began on One Nation Underground at Impact Sound, in New York. The sessions began on the ‘6th’ of May 1967, and were scheduled to last just four days. The band planned to record ten songs, including the six penned by Tom Rapp. He had written Another Time, (Oh Dear) Miss Morse, Drop Out, Morning Song, Regions Of May and Uncle John. Lead vocalist and guitarist Tom Rapp also two songs cowrote Ballad To An Amber Lady and I Shall Not Care. It took just four days for Pearls Before Swine to record One Nation Underground, and the session was completed on ‘9th’ May 1967. Five months later, and Pearls Before Swine released their debut album One Nation Underground. Critical acclaim accompanied the release of this minor psychedelic folk classic. When One Nation Underground was released, it was soon, well on its way to becoming ESP-Disk’s most successful recording. It’s thought that One Nation Underground sold anywhere between 100,000 to 250,000 copies. This should’ve proven profile for Pearls Before Swine. Alas, contractual problems meant that Pearls Before Swine received very little in the way of royalties. Later, a rueful Tom Rapp alleged: “we never got any money from ESP. Never, not even like a hundred dollars or something.” For Pearls Before Swine this must have been disheartening, especially as they were still under contract to ESP-Disk. In early 1968, Pearls Before Swine’s begun work on their sophomore album, Balaklava. By then, there had been a change in the band’s lineup. Jim Bohannon had replaced Roger Crissinger. Meanwhile, Tom Rapp continued in his role as Pearls Before Swine’s songwriter-in-chief. For Balaklava, Tom Rapp wrote eight of the ten songs on the album and cowrote Translucent Carriages. The other song on the album was a cover of Leonard Cohen’s Suzanne. These songs were recorded with producer Richard L. Alderson[ at Impact Sound in New York. When the recording sessions began, Pearls Before Swine were augmented by session musicians. They added flute, English horn, piano, organ, guitar and strings. Overdubbing was used extensively, with recordings of Florence Nightingale and the original buglers from the Battle of Balaclava in 1854 added to Balaklava. They played their part in an album of evocative, cerebral and complex music which was full of allegorical classical references. Just over a year after the release of One Nation Underground, Balaklava was released to the same critical acclaim as its predecessor in November 1968. Critics marvelled at the innovative way songs were arranged and the eclectic nature of instruments deployed on Balaklava. It was an album that the band were extremely proud of, and which critics hailed as more than a fitting followup to One Nation Underground. 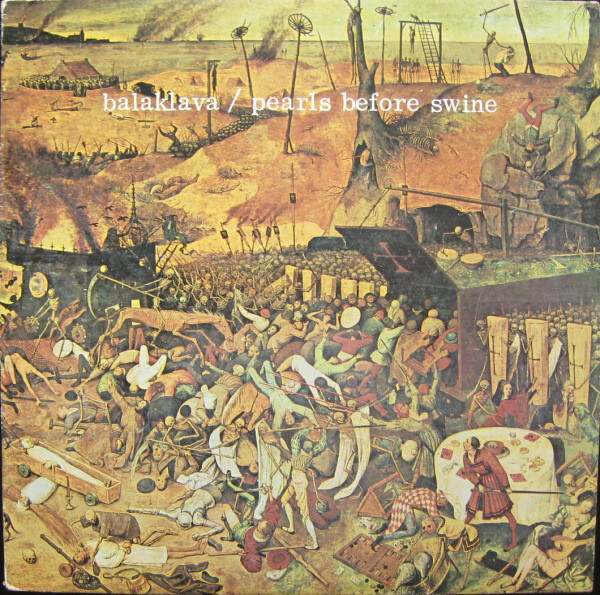 However, despite the critical acclaim Balaklava received, all wasn’t well within Pearls Before Swine. Not long after the release of Balaklava, Tom Rapp managed to negotiate his way out of the contract with ESP-Disk. This left him free to sign with Reprise Records, which was home to many folk and folk rock artist. However, the rest of Pearls Before Swine didn’t follow Tom Rapp to Reprise Records and called time on their career with the band. The rest of Pearls Before Swine had never played live during their time together. This wasn’t ideal for a band trying to make a breakthrough. After that, Pearls Before Swine consisted of Tom Rapp his wife Elisabeth and session musicians that were brought onboard for recording sessions and tours. The first album that this new lineup would feature on was, These Things Too. Having signed to Reprise Records, Tom Rapp was keen to get to work on the next Pearls Before Swine album. This would eventually become These Things Too, which marked the start of the Reprise Records’ years. For These Things Too, Tom Rapp wrote ten new songs. He also wrote Green And Blue and Mon Amour with his wife Elisabeth and added music to W. H. Auden’s poem Footnote. The only cover version on the album was Bob Dylan’s folk anthem I Shall Be Released. It was covered in the familiar surroundings of Impact Sound, in New York. This was the same studio where Pearls Before Swine recorded their first two albums. They were produced by Richard L. Alderson, who returned to produce These Things Too. He helped put together the session musicians who would feature on the album. One of the musicians Richard L. Alderson brought onboard was Jim Fairs who previously, had been a member of the garage band The Cryin’ Shame. Jim Fairs played on These Things Too and co-produced the album. It featured jazz drummer Grady Tate, bassist Bill Salter, electric violinist Richard Greene, who later would join Seatrain. This small, but tight and talented band recorded the fourteen songs that became These Things Too. The release of These Things Too was scheduled for September 1969. 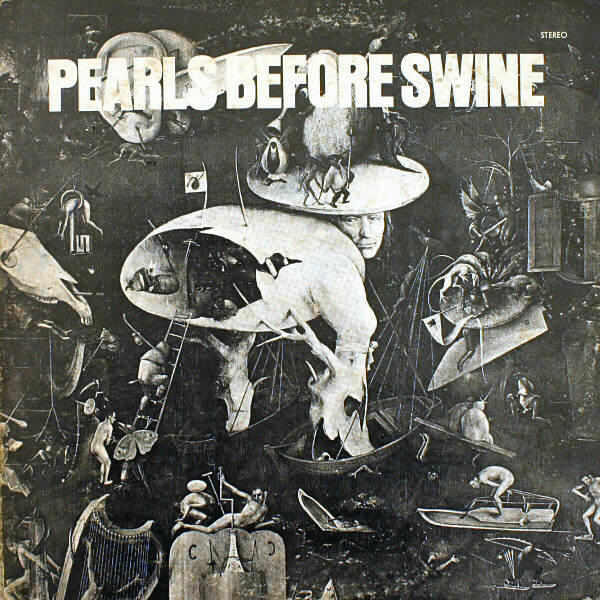 Before that, critics had their say on Pearls Before Swine’s Reprise Records’ debut. While the album was well received by critics, it didn’t receive the same critical acclaim as previous albums. Critics described These Things Too as a mystical and “dreamy” sounding album. Later, it turned out a reason for the album’s dreamy sound. 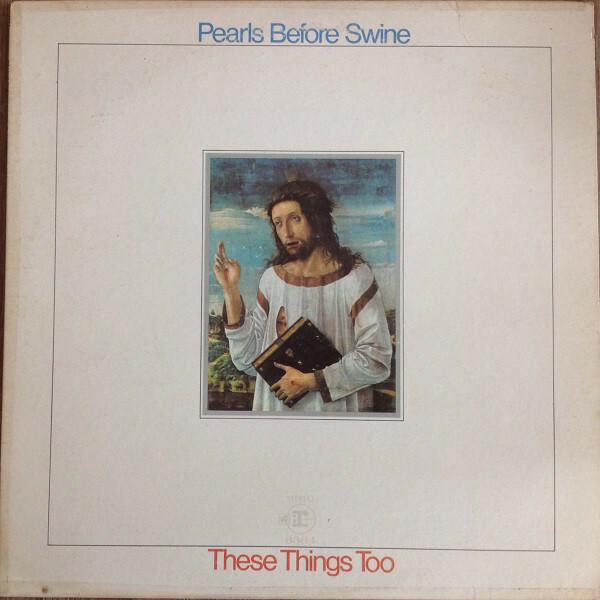 Tom Rapp later admitted that These Things Too was the first Pearls Before Swine album that: “reflected drug use in the writing of the songs.” This was a first for Pearls Before Swine. Nowadays, These Things Too has been reappraised by critics, and is regarded as one of Pearls Before Swine’s most underrated albums. It was also one of the Pearls Before Swine’s least successful albums. These Things Too didn’t sell in vast quantities, and was a disappointing start to Pearls Before Swine’s time at Reprise Records. 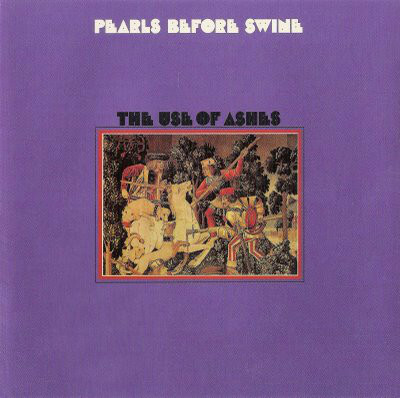 By the time that Tom Rapp began writing Pearls Before Swine fourth album, The Use of Ashes he and his wife Elisabeth were living in the Netherlands. That was where Elisabeth was born and brought up. Tom and Elisabeth Rapp had sailed from New York to the Netherlands on the maiden voyage of the QE2. This was idyllic journey and one that was sure to provide inspiration for Tom Rapp. On their arrival in the Netherlands, Tom and Elisabeth Rapp spent several months living in a house near Utrecht. That was where Tom Rapp began writing The Use of Ashes. Most of the ten songs that feature on The Use of Ashes were written by Tom Rapp in Utrecht. It was the first album he had written entirely himself. Elisabeth is credited as having helped pen God Save The Child, while Rocket Man was based on a short story by Ray Bradbury. Rocket Man was heard by Bernie Taupin, and would inspire him to write Rocket Man for Elton John. That was still to come. Before that, a decision was made to record The Use of Ashes in Nashville. Peter H. Edmiston was brought onboard to produce the album, and some of Nashville’s top sessions musicians would feature on The Use of Ashes. This included many of the members of the country rock band Area Code 615. They made their way to Woodland Studios, in Nashville where they spent much of March 1970 was spent recording material for The Use of Ashes. By the time the sessions were over, Pearls Before Swine had more than enough music for one album. However, the albums wasn’t complete and some sessions took place at Impact Sound, in New York. After that, The Use of Ashes was ready for release. In August 1970, The Use of Ashes was released to widespread critical acclaim. Critics hailed the album a return to form from Pearls Before Swine. They had reached the same heights as One Nation Underground and Balaklava. However, some critics preferred The Use of Ashes which featured country rock, folk rock and psychedelic folk. It was a much more eclectic album, which featured some of Tom Rapp’s finest songs. Especially The Jeweller, which was later recorded by This Mortal Coil, the cinematic Rocket Man and the jazz-tinged, playful Tell Me Why? One of the highlights was Riegal, a sobering song that was inspired by a newspaper article that told how 4,000 prisoners of war died after the prison ship MS Rigel was sunk. It’s a poignant song, that shows just how Tom Rapp was maturing as a songwriter. The Use of Ashes featured some of Tom Rapp’s finest songs. He seemed to have come of age as a songwriter, on what was Pearls Before Swine’s most successful album for Reprise Records. Things were looking up for Pearls Before Swine. When it came time for Pearls Before Swine to begin work on their third album, and fifth album overall, Tom Rapp announced that he wanted equal billing with the band he had founded six years earlier in 1965. From City Of Gold, onwards the band would be billed as Thos. Rapp and Pearls Before Swine. Much of what would become City Of Gold had already been recorded in Nashville, during the sessions for The Use of Ashes’ album. Further sessions would take place at Impact Sound, in New York with Tom Rapp taking charge of production. Eventually, eleven tracks featured on City Of Gold. This included seven Tom Rapp compositions, including Once Upon A Time, Raindrops, City Of Gold, The Man, Casablanca Wedding and Did You Dream Of? Tom Rapp also added music to William Shakespear’s Sonnet #65. They were joined by cover versions Leonard Cohen’s Nancy, Jacques Brel and Rod McKuen’s Seasons In The Sun and Judy Collins My Father. These tracks became City Of Gold, which was Pearls Before Swine’s fifth album. Once Upon A Time was scheduled for release in April 1971, and was a mixture of country folk, country rock and folk rock. The album was well received by critics, who noticed that Tom Rapp was continuing to mature as a singer and songwriter. He had come of age as a songwriter on The Use Of Ashes, and this continued on Once Upon A Time, much of which was recorded at the same time. While Once Upon A Time, features some of Tom Rapp’s finest lyrics, the cover versions are tailor made for Pearls Before Swine. Especially the spartan cover of Leonard Cohen’s Nancy, which features an impassioned vocal. It’s one of several heartfelt vocal from Tom Rapp on Once Upon A Time. Elisabeth gets a chance to shine on the cover of Judy Collins’ My Father. However, for much of the album, the spotlight shines on Tom Rapp. He had matured into a talented storyteller by the time Once Upon A Time was released in April 1971 Tom Rapp. who takes the listener on a journey on the songs that he had penned. Especially on songs like the poignant Once Upon A Time and Raindrops which is tinged with sadness. There was a cinematic quality to Casablanca and especially Wedding, which is a captivating and emotive song. However, it’s a case of keeping the best to last with Did You Dream, which is a perfect showcase for Tom Rapp’s as he delivers another heartfelt vocal that’s full of emotion. Just like he has done so often on Once Upon A Time, he breathes life and meaning into the lyrics. Sometimes, there’s a nod to Bob Dylan, and other times Neil Young. Mostly, though, Tom Rapp is happy in his own voice on Once Upon A Time. Just like his two previous albums for Reprise Records, Once Upon A Time didn’t sell in vast quantities. Pearls Before Swine had a loyal fan-base, but their music deserved to reach a much wider audience. That hadn’t happened so far. Tom Rapp was hoping that things would change when …Beautiful Lies That You Could Live In was released. …Beautiful Lies That You Could Live In. 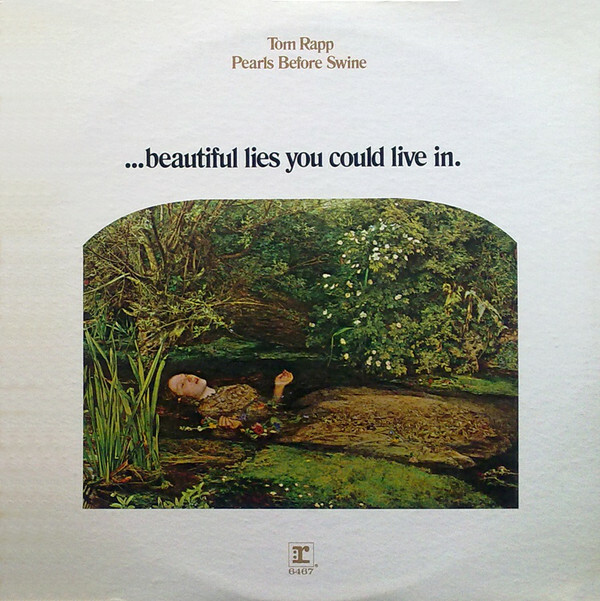 Recording of …Beautiful Lies That You Could Live In had taken place in early 1971, so that Pearls Before Swine could embark on their first tour. That was highly unusual for a band that was formed in 1965. Most bands spent much of their time on the road. However, Pearls Before Swine weren’t most bands. They were one of music’s best kept secrets, despite releasing five albums. Pearls Before Swine had still to make a breakthrough. Taking the band on the road it was hoped, would introduce Pearls Before Swine to a new audience. So with an all-star band that featured drummer Billy Mundi , guitarist Amos Garrett and pianist Bob Dorough, Tom and Elisabeth Rapp headed out on their first ever tour. In November 1971, Pearls Before Swine were preparing to release their sixth album …Beautiful Lies That You Could Live In. It featured eleven songs, including nine from the pen of Tom Rapp. Elisabeth Rapp wrote music to A. E. Housman’s Epitaph On An Army Of Mercenaries. The other song on …Beautiful Lies That You Could Live In was a cover of Leonard Cohen’s Bird On A Wire. These songs were recorded at three studios with producer Peter H. Edmiston. Recording of …Beautiful Lies That You Could Live In took place at A&R Studios and Aura Sound, New York, and at Bearsville Studios in Woodstock. This was where Tom Rapp and Pearls Before Swine recorded an album that moved towards what was a much more orthodox folk rock sound. a cohesive album that showcased Tom Rapp’s skills as a singer, songwriter and storyteller. Just like on previous albums, he had the ability to breath meaning and emotion into the lyrics and make the songs come to life. This he did on throughout …Beautiful Lies That You Could Live In, which surely, would introduce Tom Rapp and Pearls Before Swine to a much wider audience? Sadly, that wasn’t to be, and when …Beautiful Lies That You Could Live In was released was a familiar story. The album didn’t reach the wider audience that it so richly deserved. That was despite the popularity of folk rock. It seemed that Tom Rapp and Pearls Before Swine were destined to remain one of music’s best kept secrets. After the release of …Beautiful Lies That You Could Live In, Tom Rapp decided to embark upon career as a solo career. His debut solo album Familiar Songs, was released on Reprise Records in 1972. Despite what was another album of carefully crafted songs, it was a familiar story for Tom Rapp, when the album failed to find an audience. For Tom Rapp, Familiar Songs marked the end of era. Not long after Reprise Records released Familiar Songs, they parted company with Tom Rapp. He signed to Blue Thumb Records, and released Stardancer later in 1972. Stardancer featured the impassioned underground anti-war anthem Fourth Day Of July, which was part of an album that won the approval of critics. Despite this, still, commercial success continued to elude him. Tom Rapp returned in 1973 with Sunforest, which featured a mixture of folk rock, art rock and jazz. Although Sunforest wasn’t as strong an album Stardancer it showcased a talented a singer-songwriter. When the album was released in 1973, it failed commercially and Tom Rapp’s talents were no nearer to finding a wider audience. For Tom Rapp this was hugely frustrating. So much so, that after his contract with Blue Thumb Records expired, Tom Rapp turned his back on music. He enrolled at Brandeis University and graduated in 1981. Tom Rapp then enrolled at University of Pennsylvania Law School and three years later, in 1984, embarked upon a career as a civil rights lawyer. This was the start of a successful legal career for Tom Rapp. It wasn’t until 1997 that Tom Rapp returned to music, when he made a guest appearance at the Terrastock music festival. Although his comeback was successful, still Tom Rapp continued his career as a civil rights lawyer. However, two years later in 1999, Tom Rapp returned with a new album A Journal Of The Plague Year. This was the first album that Tom Rapp had released since Sunforest in 1973. Since then, Tom Rapp hasn’t released a followup to A Journal Of The Plague Year. Instead, he’s concentrated on his successful legal career. Law’s gain is music’s loss. Twenty years have passed since Tom Rapp released A Journal Of The Plague Year. Since then, his quartet of solo albums and the six albums he released with Pearls Of Swine are starting to find a wider audience. This hopefully, will continue to be the case. 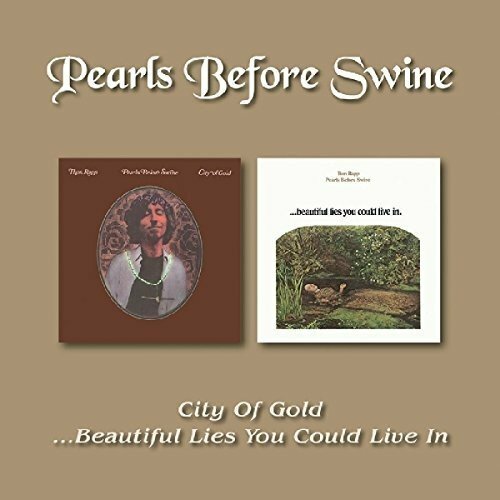 Especially with BGO Records’ recent remastered reissue of City Of Gold and …Beautiful Lies That You Could Live In, which are the perfect introduction to Pearls Of Swine, who are one of the folk rock’s best kept secrets. ← ANNELI DRECKER-REVELATION FOR PERSONAL USE.